Kildare Town beaten by Newbridge United. 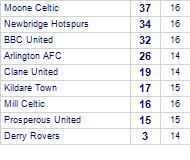 Newbridge United has yet to be beaten in this competition, having won every game. Kildare Town take all points from Bush Celtic. Kildare Town has yet to be beaten in this competition, having won 2 out of its last 3 games. Clane United suffer defeat to Kildare Town. Kildare Town has yet to be beaten in this competition, having won 1 out of its last 2 games. Kildare Town despatch Newbridge United. BBC United suffer defeat to Kildare Town. BBC United has yet to win in this competition, having lost all 3 games. Newbridge United lose to Kildare Town. Newbridge United has yet to win in this competition, having lost all 3 games. Kildare Town take spoils against Newbridge Hotspurs. Kildare Town beat Naas AFC. Newbridge Hotspurs share points with Kildare Town. Newbridge Hotspurs has yet to be beaten in this competition, having won 3 out of its last 4 games.